Profile: Battletrap can best be described as playful - in the same sense that a cat is playful with a mouse that it's caught before the cat moves in for the kill. If his two components were humans they'd very likely be a wrestling tag-team. He likes to trap an adversary between his jeep and helicopter components and have "fun" with him - knock him back and forth a bit - before finally ripping him to pieces. He's cheerful and good-natured - no doubt because he enjoys his work so much. 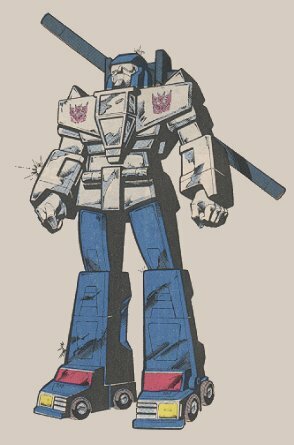 Abilities: Battletrap can divide his robot into two separate and autonomous vehicle modes - jeep and helicopter. The two vehicles have identical personalities and can recombine into robot mode in 1.6 seconds. The jeep has a maximum speed of 90 mph and a range of 600 miles. In robot and jeep modes, Battletrap uses a double-barreled, wire-guided assault missile launcher with infra-red imaging for night-firing capabilities. The helicopter has a maximum speed of 780 mph and a range of 1200 miles. It is packed with electronic detection, jamming and communication equipment. Weaknesses: Battletrap has good strength in robot mode, but sacrifices much of this for mobility when he divides into his two vehicle modes. Neither vehicle is especially rugged or weapons-fire-resistant.